Soon after Billy Griffiths joins his first archaeological dig as camp manager and cook, he is hooked. 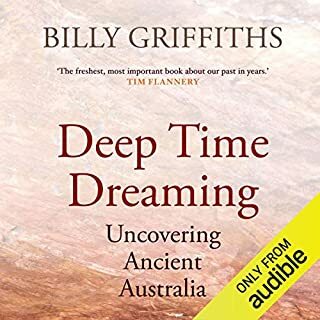 Equipped with a historian’s inquiring mind, he embarks on a journey through time, seeking to understand the extraordinary deep history of the Australian continent. Deep Time Dreaming is the passionate product of that journey. It investigates a twin revolution: the reassertion of Aboriginal identity in the second half of the 20th century and the uncovering of the traces of ancient Australia. This is the story of William "Skip" Sands, CIA, engaged in Psychological Operations against the Vietcong, and the disasters that befall him. This is also the story of the Houston brothers, Bill and James, young men who drift out of the Arizona desert and into a war in which the line between disinformation and delusion has blurred away. In its vision of human folly, this is a story like nothing in our literature. This hugely engaging story of murder, superstition, religious politics and drama in a medieval monastery was one of the most striking novels to appear in the 1980s. The Name of the Rose is a thrilling story enriched with period detail and laced with tongue-in-cheek allusions to fictional characters, the most striking of which is the Franciscan friar William of Baskerville, who displays many characteristics of Sherlock Holmes. 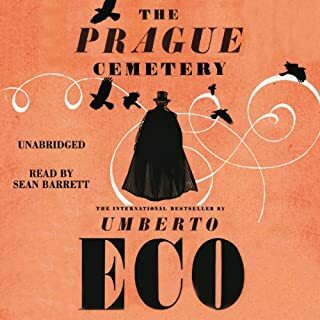 Although he looks at the past through a postmodern lens, Eco catapults his listeners into the dark medieval world as Brother William tries to discover why people are dying inexplicably and nastily in the monastery. There is something not altogether right within the library that is the pride of the establishment.... The old man Adso, who was an impressionable novice at the time, tells the story. I found the narrators pacing a little fast. 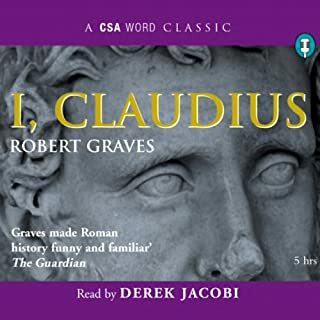 I was intrigued by the story, but sometimes found long stretches of Latin to be disorientating, I don't think it translates into audio form very well. In the original book form, I could have looked up the words or taken a guess at the meaning from my primitive understanding of romance languages; in audio form they were meaningless. 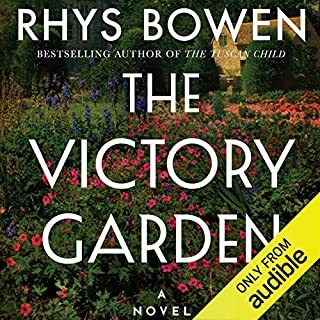 I sometimes found the narrator hard to understand even in English, having to skip back and listen intently, but his voicing of the various characters was quite good. If audible has a 0.75x playback speed instead of just 0.5x it would have helped. This is a phenomenal piece of work perfectly executed in the oral format- it’s erudite and witty and ultimately profound in its historical and spiritual revelations. I have been looking forward to The Name of the Rose for some time. Unfortunately, I found it tough going with the narration and inflection. It was distracting from the story at times. Whilst I did make it through I picked up my physical copy to reread because I feel I missed parts of this story. An incredible, erudite masterwork of crime fiction and spiritual philosophy, performed with an equal commitment and excellence. The medium is the stupendous message. If you could sum up The Name of the Rose in three words, what would they be? Sensational.. ( in the truest sense of the word) Humbling. Illuminating. What was one of the most memorable moments of The Name of the Rose? Near the ending of this dense, labyrinth- like novel, the novice Adso, through whose now aged eyes we share the myriad incidents and and ancient tales, witnesses his Master and champion for what he in part is. William of Baskerville is a man full of his own vanity sparring with another man full of hubris in the literary, intellectual vastness of each other's intelligence. It is remarkably rare to have the privilege to share the sounds of the philosopher's sword clash repeatedly with the maniacal clang of a frenzied believer over a Thought or Notion. The stakes are terribly high, have always been and one hopes always will be. One man utterly believes that if the gravitas of Aristotle is accorded to Comedy and Laughter all fear and therefore power over others will be irretrievably lost. The other believes that all freedoms are ours to take and use, whatever the consequences. The feelings aroused by this purely spoken interchange ( one of many, many throughout the novel) are overpowering and as visceral as the ubiquitous visual equivalents,No car chases, no explosions, no overt body count. Yet what is being discussed is the power of words wherever they are uttered and the often dreadful but also so often empowering gift some other person' s words can bring to us. Again I sought out this actor's name and again, when it intersected with an interest of mine ,I chose to listen to his performance. What a tour de force. 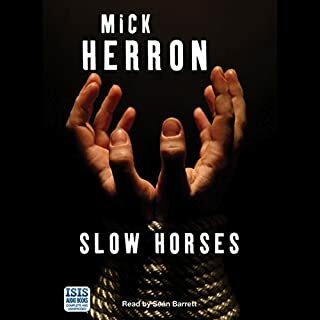 His voice is redolent of a medieval, cosmopolitan milieu...ranging from youthful, Latin, mad and arrogantly intelligent monks to an aged but still insightful narrator. What sustained, remarkable skill.To think last week I was transported through the streets of contemporary Oslo in a police car with the voice of this Actor. That in itself is a testament to the marvels of free imagining and the remarkable freedoms available to some. Yes. 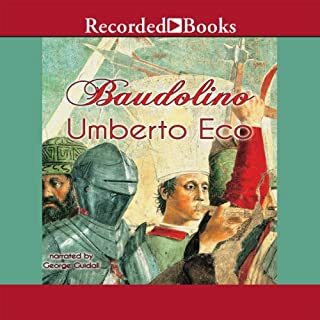 Umberto Eco deserves his scholarly place amongst the firmament of semiotic academics who manages to successfully link such disparate historical facts( or imaginative guesses), religious events, massive knowledge of ancient history and the vicissitudes of all of our human appetites to meld together chapter after chapter where we cannot but be involved. One is coaxed into terrifying mists, funny conversations, smelly kitchens and horrendous grief at monumental loss. It is a provocation on every page for testing one's acumen from remembering " the joke about.." from a " The Simpsons " episode, yes, remembering a long forgotten sexual encounter, yes, and trying to remember what the Latin for disappointment was, yes. To assist laughing and crying lay a Bible, a Latin dictionary, a guide to ancient History, a semiotic/ signs text, a guide to architecture..I won't go on..you get the picture..or a great technological device alongside whatever you are listening with if you want to wring the most out of this novel.Or just enjoy the mystery. Listen to this novel if you want to remember why you read it and wept so many years ago. 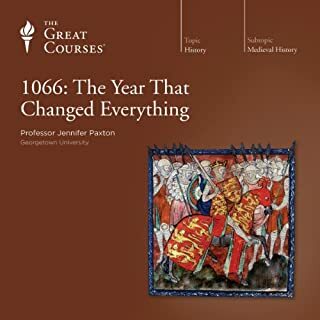 Listen to it if you really want to learn or remember things you learnt and had forgotten about History and how important elemental things remain in all our lives.It is a challenge but it is worth it. At first, I was quite mesmerized by this book. The book cleverly made to feel like a first-person depiction from the time, and feels very genuine. 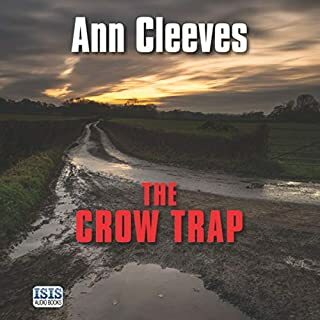 The characters are not only well built, they also think like medieval monks (with the exception of the main character, William of Baskerville, a rational, ahead of his time free thinker, who thinks and acts much more like a modern man). However, it appears the author, a world renowned intellectual, was quite keen on displaying his vast knowledge of the period, resolving many times with endless surveys of medieval church politics and tedious descriptions of theological views, marginal character history, artifacts etc. In fact, it sometime feels like the plot is only an excuse for the author to show off his intellect, who ironically indulges in the sin of pride like many of the characters in his book…Slowly, I began to wander off and lose track of the plot. Not a good thing, especially in a mystery novel. 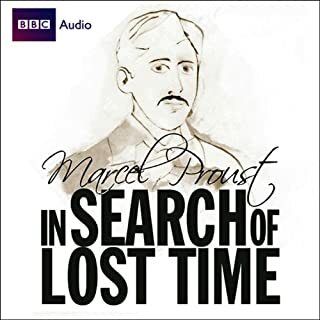 I would recommend this audio book to enthusiasts of this particular era, but for those, like me, who are fun-loving history buffs – I felt it was spending too much effort on wowing the readers with mind blowing quantities of information, and not enough on giving them a great read. The narration by Sean Barrett was incredible. It is quite overwhelming knowing all characters were played by one very talented person. Every character had its own distinct voice, tone and accent, and the narration was as vivid as a theatrical show. This historical search for the lost Second Book of Aristotle and the murderer of seven monks follows a labyrinthine path, like the rooms of the library the monks have sworn to protect. 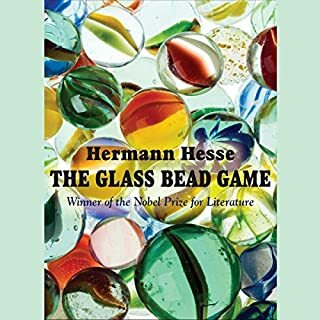 Now, 30 years since it was first translated into English, the pace seems too slow for modern tastes (compared to, say, "Wolf Hall"). The amount of detail is comparable, if not in excess of other very good historical fiction, but the "care factor" is lower. I have commented before that I never though that I could like Cromwell until I read Wolf Hall. 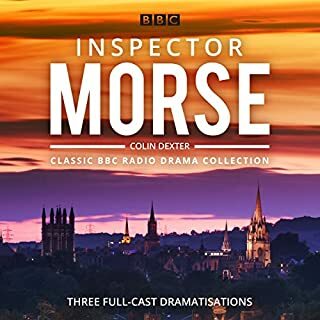 I'm afraid I simply have no care for the dead monks, or even William of Baskerville (whom I pictured as Sean Connery throughout, although the narrator, Adso, I saw as no Christian Slater; more a minion than a martyr). I found the tale too dense, the characters unappealing (even the ones that you suspect you're meant to dislike, like Bernado Gui, the inquisitor) and the discourses too frequent to maintain the pace of the investigation. That investigation takes seven days, but it took me considerably longer to listen to the whole title. None of this can be laid at the feet of Sean Barret, who performs the roles with dexterity and good character differentiation. 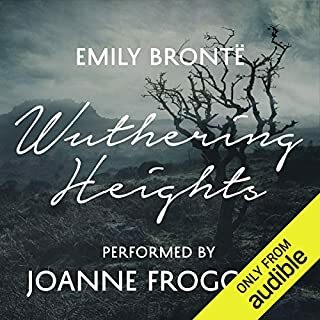 I wanted to like this more than I did and I suspect I will be condemned as a Philistine for the overall rating, but it simply was not my cup of poison. Narration Makes this book too Good. Sean Barrett is an amazing Narrator. 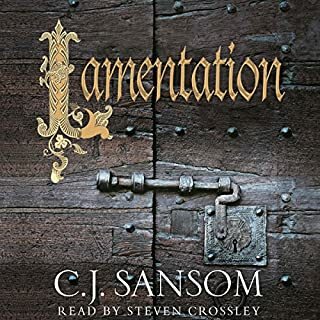 I removed so many books from my library after listening to this one because their narrators weren't palatable anymore. Also, I don't think I could have read this story. it's only in audio form that I can possible consume it. The story is a bit slower than my taste, but it's so scrumptious. Many things have been said in Italian. I should have known before buying the unabridged version. However, nicely enough, this makes the experience far richer. Muy rico en lenguaje e imaginación. Temas de existencialismo y entedimiento de los sentimientos se mezclan con la crítica del poder. A most beautiful and memorable masterpiece. Avoid spoilers at all cost. This is a true adventure in philosophy and religion, and a great thriller as well. The narraton is delightful, and while sometimes becomes too loud, gives life to the story, and adds to the experience. The German Monk is Adso of Melk, who, as an old man wrote a chronicle about his time in 1327 as the novice disciple of the Franciscan Brother William of Baskerville, when the pair traveled to an Italian Benedictine abbey whose name must remain secret due to the terrible events that happened there. William was on a mission to represent the separation of church and state views of the Holy Roman Emperor Louis to the Papal legates of Pope John, as well as to try to arrange a meeting of the minds between the Franciscan monks who embraced the poverty of Christ and the Papal authorities who denied it (to avoid calling into question their great worldly possessions and powers). No sooner do William and Adso arrive at the abbey than they learn that a talented young illuminator has fallen to his death from a high window, and William, a former inquisitor (a post he resigned because he could no longer distinguish between heretics and holy men or stomach the use of torture to obtain confession), is asked by the Abbot to investigate. 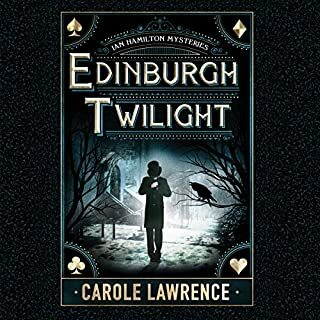 Thus begins a murder mystery lasting seven days and involving the abbey library (both the greatest in Christendom and a labyrinth), a dangerous book, the Apocalypse, and a motley set of monkish suspects. In addition to being an absorbing mystery, The Name of the Rose is such a vivid and detailed historical novel that it becomes both an encyclopedic window into the past and a distorted mirror of the present. The ethos of the Catholic monks, how they felt about science, love, women, animals, infidels, class, authority, heresy, piety, art, books, the Word, the world, the hereafter, Christ, God, Satan, and the antichrist, is fascinating. They earnestly argued about things like the laughter and poverty or lack thereof of Jesus, and lived in a chaotic era marked by feuding Emperors and Popes, starving peasants, and ravening vagabonds. The abbey feels like a real place, including the Church, Dormitory, Infirmary, Stables, Smithy, and Aedificium (the building with library, scriptorium, kitchen, and crypt). 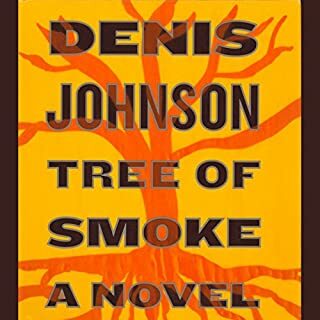 While vividly depicting all of the above, the novel treats themes about epistemology, semiotics, truth, and love, and explores matters like the preservation, pursuit, and sharing of knowledge, the uses and abuses of fantasy, nonsense, and humor, and the difficult attempt to find design, pattern, and meaning in a world that possesses either many or none of such things. William is a medieval Sherlock Holmes, hailing from Baskerville and sharing with the great detective a faith in deductive reasoning, intervals of torpor, occasional "drug" use, a tall and thin body, and a desire to find the truth by reading the world like a book. His deductive method is opposed to that of Catholic inquisitors, who use torture to prove the guilt of the accused. The relationship between William and Adso, his naïve and earnest Watson, is entertaining and moving. Adso feels hero-worship for his master, punctuated by moments of incomprehension or disappointment. "A dream is a scripture." "True love wants the good of the beloved." "Formulating hypotheses made me nervous." "Madmen and children always speak the truth." "The devil is the arrogance of the spirit, faith never seized by doubt." Adso, who believes that "There is nothing more wonderful than a list," lengthily lists infernal animals (manticores, vultures, octopi, incubi, etc. ), rascals (cardsharps, tatterdemalions, false paralytics, pardoners, etc. ), relics (lace from the Virgin Mary's wedding dress, a portion of the crown of thorns, a shred of the table cloth from the last supper, a piece of the manna that fell from heaven, etc. ), and more. The lists pleasurably express William's belief that "the beauty of the cosmos derives not only from unity in variety, but also from variety in unity." The novel is often quite funny, as when a lovesick Adso reads various erudite texts about his condition: "How can a young monk be healed of love?" Sean Barrett reads the chronicle, Nicholas Rowe the preface, and Neville Jason the chapter titles and headings. All three are excellent. Barrett has the perfect voice for this kind of book, sensitive, scratchy, and flexible. He's particularly good with senile, holy, or evil old men, scary inquisitors, wise, humble, and humane men (like William), and innocent, easily inspired or crushed young men (like Adso). His Salvatore, the ex-vagabond monk who speaks the language of Babel, is inspired. 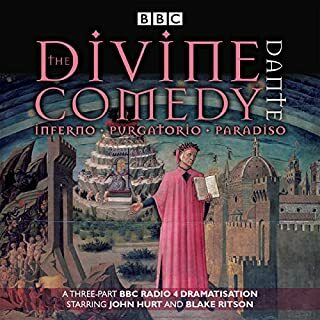 The only drawbacks of the audiobook are that it lacks the useful map of the abbey provided in the physical book, and if you don't know Latin (like me) you might at times feel left out without the printed text to aid you. People who want to read an expeditious history or a tight mystery might mutter, "Adso, get on with the story already!" But patient readers interested in fourteenth-century Europe and the history of the Church and open to the pleasures of words, images, signs, lists, and ideas, must enjoy this book. It made me slow down to savor everything and to delay the end for as long as possible. This production of this labyrinthine novel is magnificent. Wonderful characters from Mr Barrett which create the world in a terrific manner. The sort of reading that makes you want to write a review. The performer, Mr Sean Barrett, made this story even greater. I highly recommend the book and the performer. Eco writes for those who have time to revel in words, images and ideas. Always fresh, rewarding, thought-provoking and worth returning to after a gap of years. Not for those who like a rapid paced novel... well read and very enjoyable. History brought to life, even if it drags sometimes. This is a very unusual book. The story is simple but draws in the feeling and experience of 14th century Europe. If you like a bit of a mystery but enjoy your history too this is for you. Down side: certain sections go on and on for about 30 mins at a time about one single book, picture, thought etc. These really dragged for me and I zoned out at these points. However, I learnt a huge amount which I value and enjoyed the main characters a lot. If you have the patience for the slower sections it is well worth it. Would you listen to The Name of the Rose again? Why? I would. I suspect I missed out on quite a bit by zoning out during the extended treatises on the state of the mediaeval Church, the apocalypse and so on. It's a whodunnit, and it's very well structured to keep you guessing till the end. sean barrett is stunning in his oration. 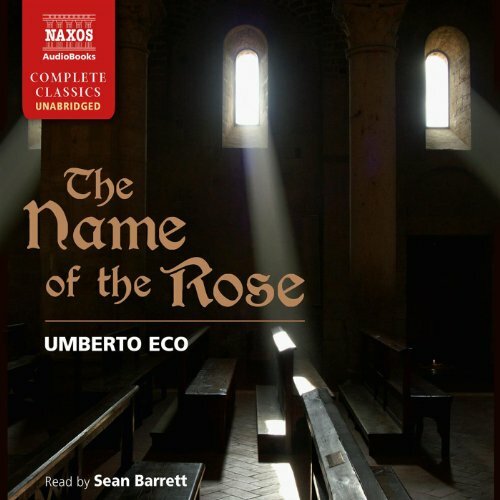 Would you consider the audio edition of The Name of the Rose to be better than the print version? Few audiobooks are 'better' than their analogue progenitors. But this audio version allows the listener to imagine a different landscape. Not 'better' but a very welcomed addition to my Eco library. 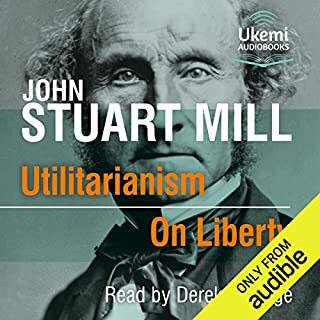 It is challenging - on one level a simple historical whodunnit, on another, a deeper investigation into the nature of knowledge, of assumption versus deliberation, of belief versus empirical study. And, it's long enough to really become absorbed within it. Plus, it introduced Eco to many non-Italian speakers for the first time. When, please, will we get Tim Curry's narration of 'Foucault's Pendulum'? Or any other reputable artiste? I have the cassette version from the early 1990s but would love a digital edition. Come on, please, Audible! 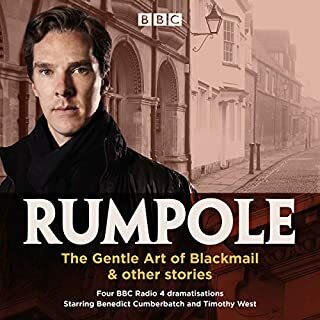 really impressive audiobook with a clever and subtle range of performances from Sean Barrett. Very immersive experience and great value.